The Ethiopian highlands have experienced intense levels of land use dynamics and forest cover transformations over the past few decades. Multiple socio-economic, demographic and bio-physical factors have driven such transformations. Nevertheless, recent expansion of urban settlements and infrastructural development could have accelerated the rate at which land cover transformations preceded but little is known about their impacts on land cover transformations in the vicinity of Addis Ababa, Ethiopia. 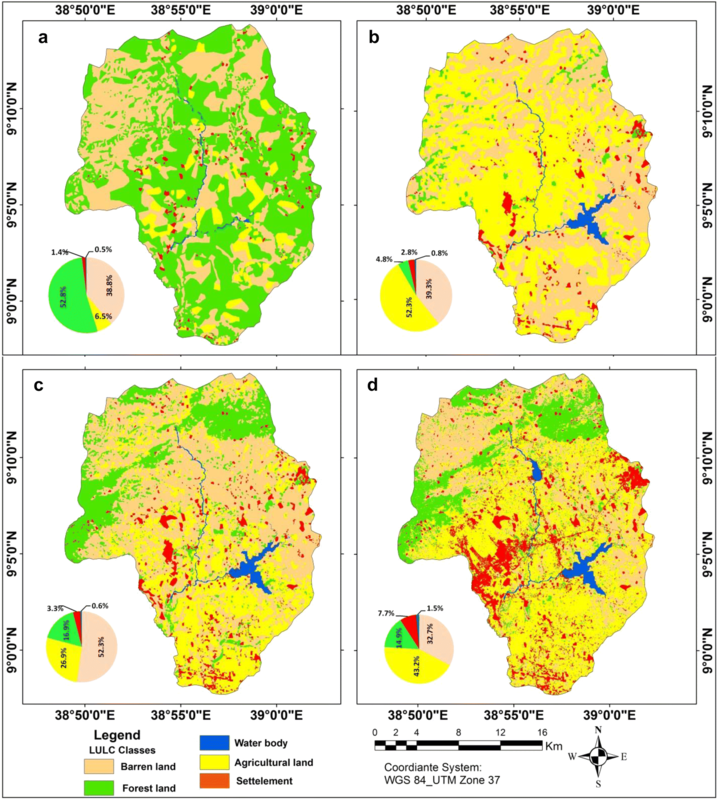 This study, therefore, focuses on detecting long term dynamics of land use/land cover (LULC) change since the 1950s and current state of forest susceptibility to degradation in North-eastern Addis Ababa, Ethiopia. In this study Panchromatic Aerial photographs (1957), MSS (1975), TM (1995) and Sentinel-2 (2017) images were used to generate LULC types. We employed object-based classification techniques to generate LULC types for 1957 aerial photographs and maximum likelihood algorithm for images of 1975, 1995 and 2017. We also generated forest degradation susceptibility map for the study area by employing a multi-criteria approach on the ArcGIS analysis platform. Over the course of 60 years (1957–2017) the extent and direction of LULC have become more dynamic. Agricultural land and forest land showed a comparably equal extent of net change (+ 36.7% and − 37.8%, respectively) but to opposite directions. Forest lost 25.1% and 18.7% of its cover to barren land and agricultural land, respectively. The net change for forest was negative except for the period 1975–1995, with varying rates of deforestation during the four distinct study periods. However, a heightened level of deforestation occurred after the mid-1990s due to rapid urban growth and a change in government economic policy. A 6.2% net change of urban/settlement served as a catalyst for LULC transformations in the last two decades. Our findings also revealed that 97.2% of forests were located at a radius of 1 km distance from urban centers and settlements whereas 92% of them were accessible by road networks of a km radius. Similarly, 71% of forests suffer from edge effects while biophysical factors such as streams as vectors of disturbance and slopes expose about 35% of forests to degradation. Over the last six decades the study area has shown an unprecedented level of LULC change. The main drivers of change were the combination of bio-physical processes especially drought cycles, demographic dynamics (population growth, density and internal migration), urbanization and successive government development policies. The massive conversion of forests to agricultural land and barren land in the study area will have far reaching impact on biodiversity and ecosystem services, land degradation and a change in local hydrological regime. Land degradation mainly due to forest clearance for agriculture and settlement has frequently been cited as the major drivers of environmental change with a wide range of socio-economic and environmental consequences (Geist and Lambin 2006; Brink and Eva 2009; Lambin and Meyfroidt 2011). Owing to deforestation and subsequent loss of productive capacity, Ethiopia faced major famines in the 1970s and 1980s (Bishaw 2001). The annual rate of forest loss in Ethiopia from 1995 to 2010 was estimated to be 141,000 ha, roughly 1.1% declines per annum (FAO 2010). The main drivers of deforestation in Ethiopia were growing demand for house hold energy, expansion of agricultural farmland and overgrazing (Bishaw 2001; Zeleke and Hurni 2001; Bewket and Abebe 2013; Kindu et al. 2013; Abrha et al. 2017). The Ethiopian highlands have particularly experienced intense levels of land cover conversions mainly due to demographic pressures and consequent expansion of croplands and household energy demands (Amsalu et al. 2007; Rosell et al. 2017). The high population growth and densities have resulted in increased demand for food and subsequently resulted in rapid transformations of land cover, particularly forests (Rahmato 2009; Getahun et al. 2017; Rosell et al. 2017). Studies indicated that in the central Ethiopian highlands massive expansion of cultivated land and settlements occurred at the expense of forests over the last half a century (Amsalu et al. 2007; Minta et al. 2018). Amsalu et al. (2007) reported 83% of forests loss between 1957 and 2000 which had resulted in a marked decline of forest cover while Minta et al. (2018) reported a 73% declined of forest cover during 1957 and 2014 in Dendi-Jeldu mountains of central Ethiopian highlands. Though both authors reported a massive loss of forest cover at the expense of cultivated land, pasture land and settlements, the rate at which farmland increase over time had declined mainly due to shortage of available suitable land for cultivation. The same pattern has also been observed in South Wollo, North-central Ethiopia (Rosell et al. 2017). Moreover, the recent urban expansions and infrastructure developments along per-urban areas of Addis Ababa have exerted additional pressure on LULC change (Leulsegged et al. 2011; Lohnert 2017). There has been a surge in population growth in the satellite towns surrounding Addis Ababa as a result of both rural–urban and urban–urban migrations (Lohnert 2017). Particularly, movement of the urban poor from Addis Ababa in search of employment opportunities due to investment on industries and real estate developments in the urban fringes have brought about significant changes on LULC (FZSeP 2011; Lohnert 2017). In this regard Leulsegged et al. (2011) reported a substantial loss of forest land mainly due to expansion of built-up areas and croplands in the peri-urban areas of Addis Ababa. This phenomenon has also been observed in the vicinity of Nairobi, Kenya, where forests were cleared for urban settlements (Mundia and Aniya 2005). This suggested that urban expansion and settlement were driving massive scales of deforestation along major urban centers (Leulsegged et al. 2011; Mundia and Aniya 2005). Thus, rapid urbanization and expansion of settlements were identified as one of the ‘hotspots’ of deforestation especially in many developing countries (Geist and Lambin 2006). 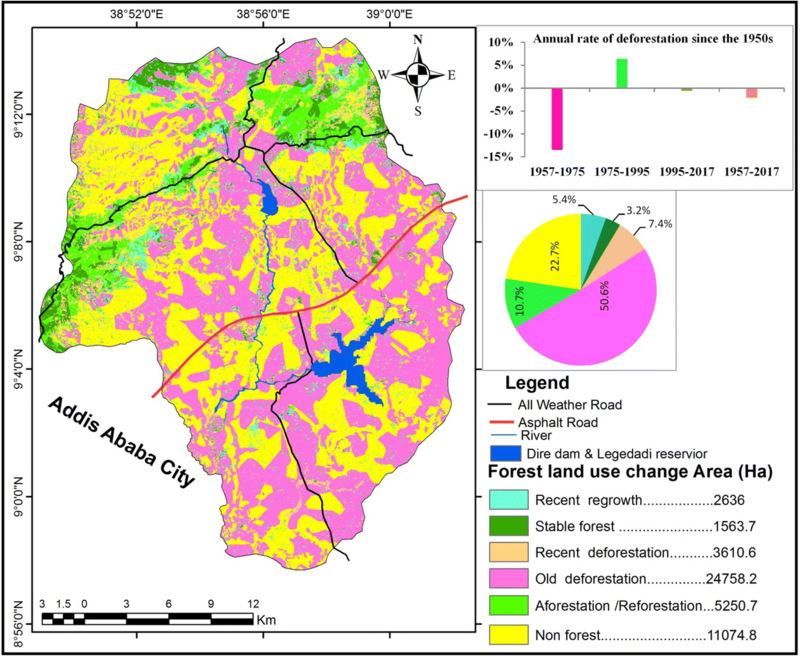 Though recent expansion of settlement and infrastructural development were acknowledged as the major drivers of land cover change and deforestation little research attention has been given to thoroughly investigate the nature and dynamics of land cover change and deforestation in the vicinity of the metropolis of Addis Ababa. 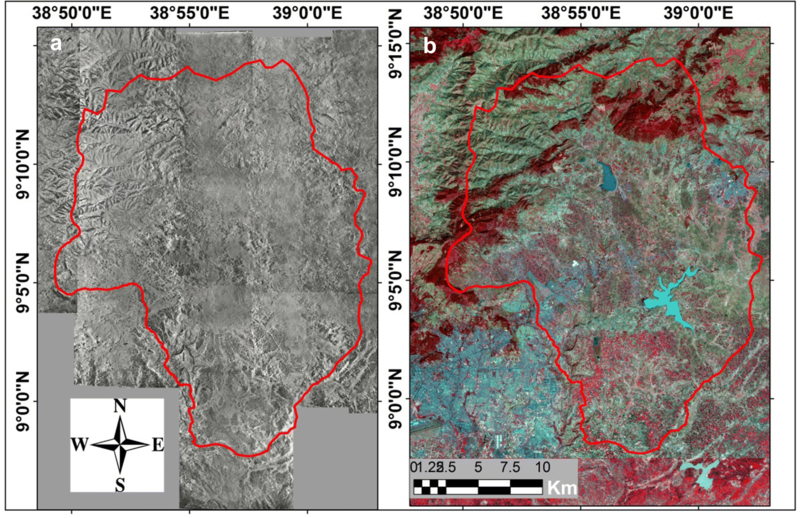 This study, therefore, focused on detecting long term dynamics of land use and forest cover dynamics by integrating remotely sensed satellite data and Geographic information system (GIS) tools since the 1950s in North-eastern Addis Ababa, Ethiopia. 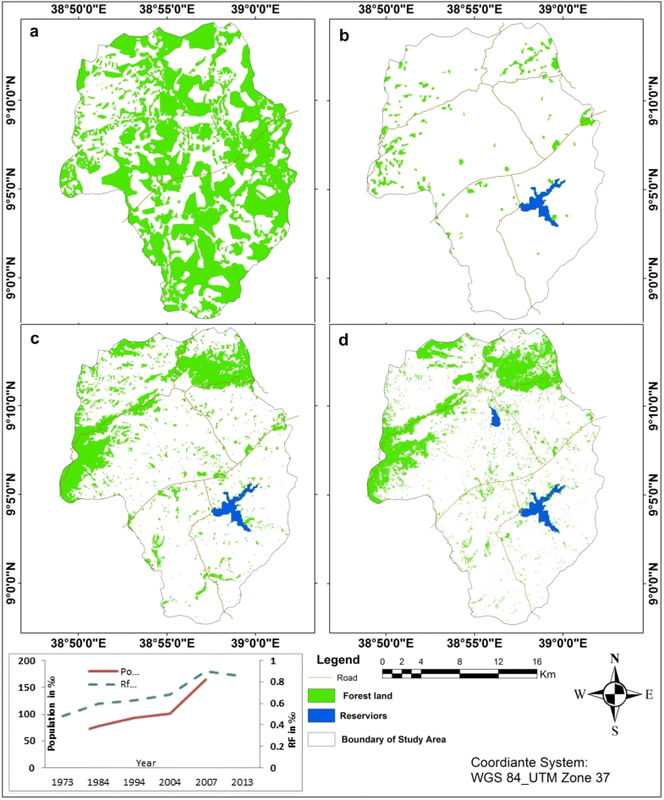 The specific objectives of this study were: (i) to quantify the extent and trends of LULC dynamics over the past 60 years along the eastern margins of Addis Ababa city, and (ii) to identify the trajectories of forest cover transitions in the study area, (iii) to map of forest susceptibility to degradation using Sentinel_2 image, GIS technology and Multi-criteria evaluation (MCE). The study was conducted in the north-eastern fringes of Addis Ababa in Oromia Special Zone, Central highland of Ethiopia. It lies between latitudes 8° 57′ to 9° 14′ 30″ N and longitudes 38° 47′ to 39° 03′ E and covers a total area of approximately 48,894 ha. The study area is characterized by diverse topographic conditions such as plains, plateaus, valleys, undulating hills and mountains with elevations ranging from 2244 m to 3240 m.a.s.l (Fig. 1). The natural vegetation of the study area belongs to the remnant dry Afromontane forest of the Ethiopian highlands which had survived millennia of human exploitation and land conversions (Friis et al. 2010). The natural forests are found in church yards and steep slopes. The remnant forest is mixed dry Afromontane forest which is dominated by conifer species namely Juniperus procera and Podocarpus falcatus in the upper canopy stratum. However, species such as Olea europaea subsp., Cuspidata are found in the church yards and in inaccessible areas along steep slopes of mountains. Population growth is very rapid due to natural increase and rural–urban migration (FZSeP 2011). According to the data compiled by FZSeP (2011) the total population in the study area was 58,137 in 1984 and it grew to over 78,000 in 1994 and almost doubled its 1984 size by crossing over 100,000 in 2007. The same document also projected that the population could reach to over 170,000 in 2013. The peasants in the study area are mainly smallholders who engaged in mixed farming where livestock are integral part of crop production. About 16 contact prints of panchromatic aerial photographs at the scale of 1:50,000 taken in 1957 were purchased from Ethiopian Mapping Agency (EMA) for the purpose of LULC classification. Likewise, cloud free Satellite imageries of Landsat MSS (1975) and Landsat TM (1995) were accessed free of charge from US Geological Survey (USGS) which was hosted by the Center for Earth Resources Observation (EROS) and Sentinel-2 (2017) images were also freely accessed from European Space Agency (ESA) for LULC classification (Table 1). The study area lies within 16 scene contacts of aerial photographs (Table 1) which had been purchased from EMA. Each contact aerial photograph was scanned in A3 formats with reasonable geometry of very high scanning resolution (1200 dpi) by considering the central axis. The radiometric resolution of each contact was 8 bit with grey scale and uncompressed formed a block. Mono registration of image to image registration and orthorectifications were employed. On each scene of scanned and processed blocks of aerial photographs about seven Ground Control Points (GCPs) were collected from river and road intersections, and churches. These GCPs were used as references with average 0.47 Root Mean Square Error (RMSE). Following these the orthorectified photos were overlaid on a 1976 topographic maps (1:50,000) which were also obtained from the EMA. We created a mosaic of 16 contacts orthophotos to form the seamless images (Fig. 2a) via ERDAS IMAGINE 2014. Features were then identified visually on the basis of shape, size and texture on the orhophotos (Teferi et al. 2013). Finally, post processing techniques such as LULC changes and forest land use/land cover transitions analysis were employed in ArcGIS 10.2. Geometric correction The USGS and ESA data centers freely provided geometrically corrected scenes (Landsat and Sentinel_2 images) which were geo-referenced to Universal Transverse Mercator (UTM) projection system Zone 37 and World Geodetic System 84 (WGS 84). In fact, the positions were checked out using scanned top-sheets at the scale of 1:50,000. For 2017 Sentinel_2 image geometric procedure techniques developed by Jensen (1996) has been performed using nearest neighbor resampling techniques, and the RMSE were recorded 0.43 (Fig. 2b). Topographic correction The data type sensor of Landsat images (L1T) obtained from EROS data center and Sentinel-2 acquired from ESA were topographically corrected; however, the study area particularly North-western and Northern fringes comprise of rugged and undulating mountainous areas. 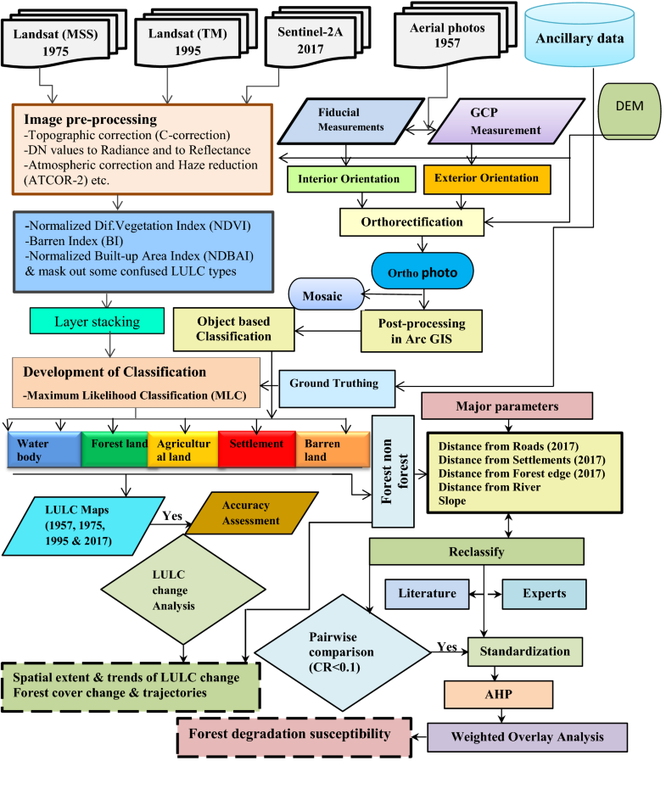 Therefore, to enhance the image data quality the entire Landsat and Sentinel images were topographically corrected using non-lambertain models for C-correction of Teillet et al. (1982) with PG-STEAMER 4.2 software. Radiometric correction All data sets of remotely sensed images were recorded at different time of periods i.e. experienced different atmospheric condition and lighting. To reduce variations of radiance values and different values in digital levels of pixels from uniform terrain the satellite image data for 1995 and 2017 used in this study were radio metrically normalized by taking into account the 1975 images as a reference in PG-STEAMER (Teferi et al. 2013). We also consulted techniques developed by Chander et al. (2009) to convert the Digital Number (DNs) values of Satellite image data into radiance (see Eq. 1) and then into reflectance values (see Eq. 2). These two techniques are important to minimize the error signals and unwanted noise emanating from earth’s reflections and atmosphere. where Lʎ is Spectral radiance at the sensor’s aperture, LMAXʎ & LMINʎ are the maximum and minimum spectral radiance values. QCALMAX and QCALMIN are quantizing calibrated maximum and minimum values. QCAL is quantizing calibrated cell values to be calibrated in bands. Pʎ is normalized, unit-less which is decisive to measure the amount of energy reaching the Earth’s surface to the amount of light bouncing off the surface and returning to atmosphere to be detected by satellite sensors. where Pʎ is Top-of-atmospheric reflectance (TOA), π is pie value with 3.14, d is Earth-sun distance, ESUNʎ is mean solar exo-atmospheric irradiance, and θs is the solar zenith angle. Haze reduction and atmospheric correction Atmospheric and terrain effects exaggerate the physical parameters of earth’s surfaces including, ground visibility, surface reflectance and temperature unless the Landsat imageries data were taken through careful due preprocess in an appropriate software. Therefore, the entire data sets obtained from USGS/EROS data center were atmospherically corrected and haze reduced via ATCOR-2 extension in ERDAS Imagine by considering image based technique of atmospheric correction and transformation (Richter et al. 2006; Vermote and Saleous 2006). In addition to the above satellite imageries ancillary data sets were consulted. In fact, to evaluate the relationship between LULC types we generated elevation and watersheds as input data sets for pre-processing; ASTER-GDEM was accessed through free of charge from US NASA. Thus, major rivers and watersheds in the area were delineated from DEM with the help of SWAT model in Arc GIS 10.2 extension. Vector overlays (e.g. roads) were obtained from EMA, and markets/settlements were digitized and exported from the LULC maps. Moreover, topographic maps dated 1973/75/76 and 1995/1996 were also purchased from EMA to identify small rural settlements (tikuls) for the year 1975 and 1995 respectively. Long term population data (1984–2013) were obtained from documented census reports (FZSeP 2011). The land use classification scheme was carried out following USGS classification system (Anderson et al. 1976). We also conducted an extensive reconnaissance survey and collected information on major LULC types from local elders to better understand the context. Accordingly five major LULC types (Barren land, Agricultural land, Forest land, Settlements and Water body) were identified (Table 2). To generate a signature for each land cover type training sites were developed from ground truth data. Since some LULC types were confused, signature separability was conducted. In this case during the preliminary classification, cultivated land was confused with barren land and settlements. So, to identify barren areas, Bare Index (BI) technique was calculated using raster calculator in Arc GIS10.2 (Eq. 3). This technique was helpful to show the relative concentrations of bare areas. In line with this to separate the settlements (built up areas) from other confused land cover classes, Normalized Difference Built-up-Area Indices (NDBAI) were computed (Eq. 4). Similarly, Normalized Difference Vegetation Index (NDVI) was also used to identify the distributions of vegetation covers and their greenness as well (Eq. 5). Finally, to increase the accuracy of classified LULC types we digitized and masked out settlements and agricultural land from the original image Teferi et al. (2013) and then the remaining parts of image were subjected to classification by using maximum likelihood algorithms in Arc GIS. where: SWIR is short wave infrared band, NIR is the near infrared band, R is red band, and B is blue band. There is no universally accepted single benchmark of sample size for reference data points. A minimum of 50 samples for each land cover classes and fewer than 12 classes should be collected for maps with area covers less than 4046.9 km2 (Lillesand et al. 2008). Accordingly, the study area with areal size of 48,894 hectares (ha) the land cover classification which consists of five major classes were identified for each time period (Table 2). Likewise, 60 samples for each LULC category were collected from aerial photos and Google-earth images. Therefore, in this study a total of 1040 reference data points from each year were collected, of which 740 and 300 were used for classification and accuracy assessments, respectively. Classified LULC categories were compared to ground truth data to evaluate the degree of accuracy of the output. Classification is not complete until satisfactory level of accuracy is achieved (Lillesand et al. 2008); thus, error matrix was performed to assess classification accuracy. At this point, the referenced and classified data were exported and performed as columns and rows, respectively in pivot table. Then after classification accuracy measurements (user and producer accuracies) have been derived from error matrix in percentage. Once the accuracy assessment was computed for each classification result the agreement and disagreement analysis was evaluated through Kappa coefficient (Khat). Kappa yields to evaluate the actual and a chance agreement between reference data and classified data. Overall accuracies were also computed by summing the number of pixels classified correctly (diagonal numbers) then dividing them to the total number of pixels (Eq. 6). User’s and producers accuracies were computed by dividing the numbers of pixels that were classified correctly in each category (diagonal entries) divided by the total number of pixels that were classified in that specified category of row total and in same category of column total respectively (see Eqs. 7 and 8). To test LULC classification accuracy multi-variety statistical measure were determined for each selected time periods by applying the formula given below (Eq. 9). where: OAC is over all accuracy, UAC is user accuracy, PAC is producer accuracy, Khat is Kappa statistics, N is total number of samples, Xij is the diagonal values, Xi+ is the column total, and X+i is row total, r is the number of categories. Stratified random sampling technique was carried out to identify the reference data. To achieve the reference data for the 1957 image classification we used already classified map and in-depth interview of local elders (Teferi et al. 2013). Aerial photos of 1973 were used as referenced data for the year of 1975 image. To achieve the reference data of 1995, the reference data of the previous maps were used (Zeleke and Hurni 2001; Teferi et al. 2013). Reference data for 2017 image classification, points were collected from Google earth image of 2017 and assisted with effective field observation. Generally, the methods for overall work flow of the study is also given in (Fig. 3). The data obtained from different sources were analyzed using software such as PG-STEAMER 4.2, ESASnap 5.0, ENVI 4.7, ERDAS Imagine 2014 and Arc GIS 10.2. To detect changes in LULC types, the area coverage of each identified LULC for the reference year of 1957, 1975, 1995 and 2017 were computed in percentage (%), and subsequently compared (Eq. 10). Cross tabulation in ArcGIS spatial analyst tool was conducted to calculate the change matrix of LULC types. The change matrix was then imported and evaluated in the form of pivot table function in MS Excel 2010. The study period was divided into four time intervals: 1957–1975, 1975–1995, 1995–2017, and 1957–2017. We computed gains, losses, persistence and net changes for each of the corresponding time periods (Table 4; Fig. 5). where: A1 and A2 are the area coverage of LULC at initial time (t1) and at final time (t2). A result of positive and negative values represents the increases and decreases in extent respectively. The forest land units for study periods were identified and visually interpreted on the basis of their spectral texture and color. The transition analysis was made only for forest trajectories (from forest to other classes) following FAO (2006) guidelines, where a land cover to be considered as a forest it should cover ≥ 0.5 ha and has a canopy cover > 10%. The two land cover types (forest and non-forest) were generated for the four temporal images dates: 1957, 1975, 1995 and 2017. We detected 37 forest land change transitions out of the possible 100 forest land change transitions and mapped those using ArcGIS. To compute the annual rates of deforestation for each study periods, we followed Eq. 11 which was developed by Puyravaud (2003). where: P is the % of the r of forest loss; Δt is the time interval in the study periods, ln is the base of natural algorithm function. Our study area is located in close proximity to the predominant urban center in Ethiopia. Therefore, we presumed that number of factors such as infrastructure networks, distance from markets/settlements and other biophysical factors such as slopes and streams may have impact on forest susceptibility to degradation. Accordingly, we identified parameters such as distance from markets/settlements, road, forest edge, streams and slope as potential factors exposing forests to degradation. All parameters were reclassified to five susceptibility classes (very high, high, moderate, low and very low). These parameters were converted to raster ASCI format to import to IDRSI SILVA. Hence, we conducted pairwise comparison by giving weight from 1 to 9 (Saaty 1990). Accordingly, we compared the data in IDRSI SILVA, and weighted overlay analysis were performed in ArcGIS 10.2. Figure 4a–d presents the classified maps of the study area for 1957, 1975, 1995 and 2017. The error matrix shows a value of 98.3% overall accuracy and Kappa Coefficient (khat) value of 0.98 for 2017 (Table 3). Similarly, overall accuracies of 96%, 91.3% and 93.3% and associated khat values of 0.95, 0.89 and 0.92 were recorded for the reference year of the image classifications of 1957, 1975 and 1995, respectively. We followed the suggestion of Landis and Koch (1977) and Congalton and Green (2009) to use the Kappa statistics for accuracy assessment. Accordingly, the Kappa statistics of a value greater than 0.80 indicates a strong agreement while a value ranging between 0.60 and 0.80 represents substantial agreement between the ground truth and classified LULC classes. Therefore, the error matrix report depicts classified maps met the accuracy requirements for change detection analysis (Anderson et al. 1976). The LULC maps of the study area were produced for the years 1957, 1975, 1995 and 2017 (Fig. 4a–d). In 1957 the landscape was dominated by forest land and barren land roughly covering over 90% of the landscape while in 1975 forest land has lost its predominant position to agricultural land (52.3%) and barren land maintained its position as the second largest LULC classes with a 39% area cover (Fig. 4a, b). In 1995 barren land had covered more than half of the landscape while agricultural land and forest land covered 27% and 17% of the landscape, respectively (Fig. 4c). In the same token, in 2017 Agricultural land constituted over 40% of the landscape while slightly over a third of the landscape was covered by barren land (Fig. 4d). This also shows that an increase in area coverage of settlements and its aggregation following roads and infrastructural development in 2017. Moreover, the spatial distribution of forest land appears to be restricted to north-western parts of the study area much further away from settlements and road networks. Similarly, Table 4 presents the general pattern of LULC change matrices for the entire study period. The three LULC types (agricultural land, forest land and barren land) dominated the landscape during the entire study period (1957–2017). These three LULC classes were also the most dynamic in terms of losing or gaining areas among themselves. In terms of persistence during the entire study period forest land (3.2%) and bare land (2.6%) had shown slightly better persistence than other LULC types. Nevertheless, except persistence, the trends of change, gross gains, losses and net changes for each study period: 1957–1975, 1975–1995, 1995–2017 and 1957–2017 vary substantially. The other LULC types such as settlements and water bodies have also shown changes. As the trajectories and rates of change vary among periods we present the results for each period separately below. The first period (1957–1975) showed a net positive change of 45.8% for agricultural land while a net decline of forest land 48.1% (Table 4). Agricultural land increased at annual rate of 12.53% during this study period with substantial gains from forest land (~ 27%). In the same period the annual rate of deforestation was about 14.5% per year (Fig. 7). In terms of persistence from the three dynamic LULC types only barren land persisted 14.4% of its original cover while agricultural land and forest land could retain only 3.8% and 2.2%, respectively. The second period (1975–1995) has shown a relatively even distribution of net changes among the three dominant LULC types as compared to the first period (Table 4). Agricultural land has shown a net negative loss of (25%), forest land and barren land have shown a net positive change of 12.2% and 13%, respectively. The most striking change in this period is not only an increase of forest land but also decline in agricultural land due possibly to drought and land abandonment as consequence of climate change and related socio-economic and political factors. In contrast to the previous period agricultural land persisted 17.7% of its original cover while barren land maintained its positions as the dominant persistent class by retaining 25% of its previous cover. The third period (1995–2017) was characterized by an advanced LULC dynamics where previously less conspicuous land cover classes such as settlement and water bodies increased their net change. Agricultural land showed a net positive change of 16.3% having gained a total of 26.9% of which 23.4% from barren land and a 4% gain from forests (Table 4; Fig. 5). The third period had also seen the rapid change in settlement especially built-up areas which showed a net positive increase from 0.4% during 1975–1995 to a 4.4% during 1995–2017, which was slightly above the national urbanization rate of 4%. The expansion of built-up areas and agricultural lands had resulted in a negative change of barren lands (− 19.5%) and forest land (− 2%) after mid-1990s. Although forests showed a net decline of 2% during this period it became more persistent (9.5%) as compared to the previous two periods (2.2%) during the first period and (3%) in the second period. Barren land and agricultural land were more stable having persisted about 19.5% and 13.5% of their previous cover during the third study period while water bodies due to its small size did not show significant change but third period was marked by expansion of urban settlements, especially Addis Ababa, and increased demand for urban water resulted in construction of dams hence water bodies grew by a net positive change of 1%. Over the course of 60 years (1957–2017) the magnitude and directions of LULC change had become more dynamic. Agricultural land and forest land showed a comparably equal magnitude of net change (+ 36.7% and − 39.79%, respectively) but to opposite directions (Table 4). Forests lost 25.1% and 18.7% of its cover to barren land and agricultural land, respectively whereas forests gained only 10.8% from the two LULC classes (Table 4; Fig. 5). The net change for forest is negative with varying levels of deforestation during the four distinct study periods. This shows a heightened level of deforestation after mid-1990s due to urban growth and a change in government economic policy. A 6.2% net change of settlement was possibly a triggering factor causing LULC change in the study area, mostly gaining areas from forest land and agricultural land since 1950s. Consequently rapid rate of urbanization and settlement further triggered increased demand of water bodies over the past 60 years. During the entire study period five of major LULC have been less persistent (maximum of 3.2% persistence by forest only) which indicates LULC change was so dynamic in terms of gaining and losing areas among land cover classes. Figure 6 presents the spatial coverage of forests while Fig. 7 shows the deforestation, afforestation/reforestation and recent regrowth activities observed in different study periods. In 1957, the total area covered by forests in the study area was 52.8%, but by 1975 it was reduced to 4.8%. In addition to areal decline of forests, the impact of drought affected the health of vegetation in the study area which was indicated by low NDVI value of (− 0.18 to 0.38) as compared to previous and later periods (− 0.33 to 0.78 for 1995 and − 0.43 to 0.64 for 2017) (Table 5). After the mid-1990s the forest cover had increased to 16.9% due to forest regeneration and rehabilitation programs of the government and concomitant increase in rainfall. Despite good rainfall conditions (NDVI value − 0.43 to 0.64) forest cover showed slightest decline (14.9%) due to the impact of urbanization and infrastructure expansion in 2017. The annual deforestation rate of 14.5%, 0.5%, 2.1% and 2.53% were observed for the periods: 1957–1975, 1975–1995, 1995–2017 and 1957–2017, respectively. The highest deforestation rate of 14.5% coincides with changes in demographic and socio-economic situations of the period in the country. Thus, it was during this period where nearly 51% forest clearance occurred (old deforestation period) and much of forest lands were converted into agriculture and settlement. Moreover, at about the end of this study period (1973–1974) climate related incidence such as drought had resulted in massive abandonment of agricultural land and contributed to increase in barren land (Fig. 7). Deforestation slowed down during second study period which was the lowest ever (0.57%) during 1975–1995. The low deforestation in this period also coincided with a massive scale of afforestation/reforestation program of the government after the mid-1980s. This program had been implemented along the mountainous and steep slope areas. The trend of deforestation increased again in the third study period (1995–2017), proceeding at a rate of 2.1% per annum. Most of the recent deforestation (3610 ha) and fresh regrowth (2636 ha) immediately after deforestation indicate this pervasive process. Over all, during the last six decades (1957–2017), only 3.2% forest land remained stable, and 10.7% forest recovered. In contrast, about 51% and 7.4% of total forest land were cleared during the first and last study periods. The result of forest degradation susceptibility based on Analytic Hierarchical Process (AHP) analysis also showed that the market-settlement, infrastructure, and biophysical factors such as slopes, streams were found to be the main drivers of environmental change. The result of AHP deviation Saaty (1990) the value of consistency ratio (cr) was 0.03 i.e. 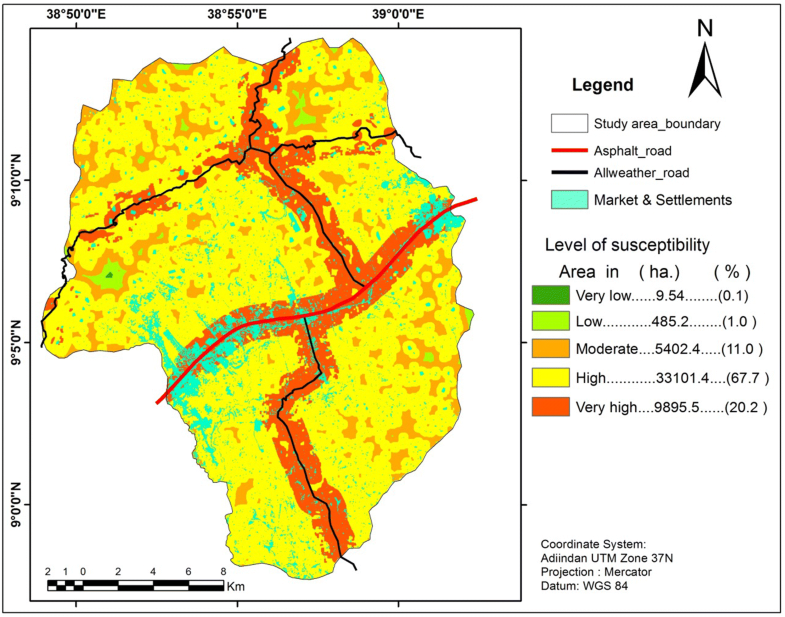 acceptable, revealed that distance from market/settlement, road, forest edge, river and slope were found to be important parameters responsible for forest degradation susceptibility (Fig. 8). The analysis showed that 97.2% of forests were located at a radius of 1 km distance from urban centers and settlements whereas 92% of them are accessible by road networks of 1 km radius. Similarly 71% of forests suffer from edge effects while biophysical factors such as streams as vectors of disturbances and slopes expose about 35% of forests to degradation. The study reveals the complexity and dynamics of LULC transitions among the five LULC classes. Agricultural land, forest land and barren land were the three dynamic LULC types dominating gains and losses among themselves and suggesting these changes may have been driven by a combination of biophysical, socio-economic and policy factors. Agricultural land and forest land showed comparably equally magnitude of net change (+ 36.7% and − 37.9%, respectively) but to opposing directions. The net change for forest was negative with varying rates of deforestation during the four distinct study periods. In addition, rapid urbanization and expansion of settlements (6.2% net increase) may have further triggered LULC transitions, mostly gaining areas from forest land and agricultural land since 1950s. As a consequence of increased rate of urbanization and settlement, water body had also shown an increase over the past 60 years. Though, forests experience a net loss during the study period it was found to be relatively stable land cover class (3.2% persistence). The study showed the four periods (1957–1975, 1975–1995, 1995–2017 and 1957–2017) had exhibited distinct LULC change suggesting typical changes in socio-economic, government land tenure policy and local climate related incidences. The first study period (1957–1975) was marked by a rapid increase in agricultural land due to population growth (Rahmato 2009; Abrha et al. 2017), imperial government land policies (Adal 2002; Rahmato 2009) and favorable climate conditions especially lack of drought until about the end of this period. Studies reported that demographic pressure in the central highlands and northern highlands resulted in declining landholding size in this period (~ 2.4 ha per household) and fragmentations which were the main factors for low productivity and degradation of the environment (Adal 2002; Rahmato 2009). In Beressa watershed north of our study area Amsalu et al. (2007) reported massive conversion of forests and other land uses to cultivated land and barren land between 1957 and 1984. For a roughly corresponding period 1957–1980 Minta et al. (2018) reported an opposite process in the western part of the central highlands where agricultural lands were converted back to pasture land as a response to decline in soil fertility or a new trend of commercialization of Eucalyptus plantation in private woodlots. Such economic impetus resulted in the expansion of plantation forest (20.5%) and recovery of the previously degraded areas (Minta et al. 2018). By contrast, the second study period (1975–1995) was characterized by a reverse in the trajectory of land cover change. 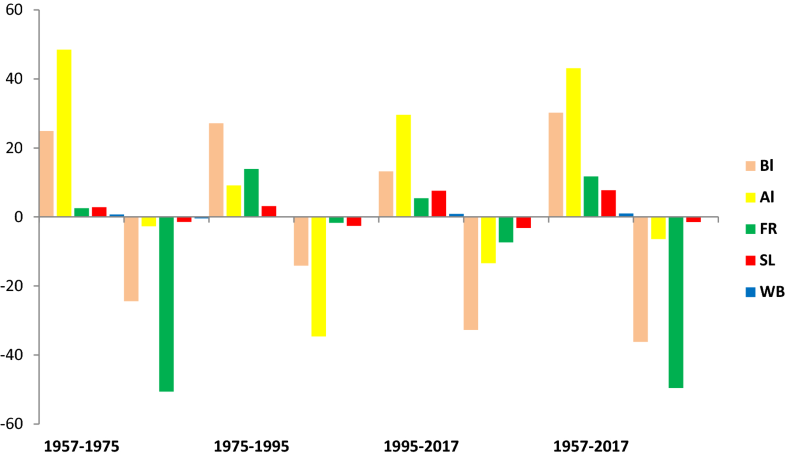 The period was particularly marked by frequent drought the first one in (1973/74) and more widespread drought in 1984/85, both of which has consequently resulted in widespread famines in the central and northern highlands (Teferi et al. 2013). Such crisis situation called for large scale afforestation/reforestation (rehabilitation programs) campaign practiced in central highlands during the Derg regime (1974–1991). Drought as a trigger for land cover change especially land abandonment and subsequent famines affected the country (Teferi et al. 2013). This followed by a nation-wide planned resettlement and villagization programs which were implemented by Ethiopian government (Getahun et al. 2017). The campaign was aimed at shifting the burden from highly densely settled highlands settled highlands to sparsely populated areas of the adjacent lowlands Amsalu et al. (2007). Amsalu et al. (2007) reported a recovery of forests observed in between 1984 and 2000 were due to implementation of massive afforestation/reforestation programs by the government in Beressa watershed, Central highland of Ethiopia. Moreover, this period seemed to have experienced land abandonment where barren land had gained 25% from agriculture. Drought as a trigger for land cover change has also been reported in the central Rift valley of Ethiopia (Biazin and Sterk 2013) and particularly spatio-temporal variability of rainfall was linked to the dynamics of land cover change along the western escarpments of the Rift valley in Ethiopia (Annys et al. 2016). Furthermore, rural land reform of 1975, where redistribution of land to landless peasants may have resulted in further fragmentation of forests Adal (2002) but its impacts possibly be masked by massive plantation activities of the mid-1990s. The third study period (1995–2017) has flipped back the dominance of agriculture at the expense of mainly forest land and barren lands. In addition to demographic pressure this study period witnessed the rapid change in built-up areas and settlements which have increased from a mere 2.8% during 1975–1995 to a 7.6% during 1995–2017. A number of factors such as socio-economic (market), demographic and government infrastructure development and investment policies stimulated massive scale of land cover conversions in the study area. In 1991 the former socialist government collapsed and replaced by ‘a neo-liberal’ economic development policy where the main factors behind land cover transformation were incentives for private investment, expansion of infrastructure and rapid urbanization. Consequently, agriculture expanded as small holder farmers engaged in production of crops for newly emerging urban centers such as Sandafa, Legetafo, Legedadi, Dire-sequru and to Addis Ababa city consumers (FZSeP 2011). This has not only created a shift of the purpose of agriculture for subsistence to market but also a reorientation of producing high value crops such as vegetables and fruits in their homesteads and fields, and nearby reservoirs. In line with this many real estate developers built very massive new residential and commercial areas, and huge factories on fertile lands following Addis Ababa-Dessie road. This resulted in a remarkable expansion of built-up areas while pressure continued on forest land. The proliferations of private investments and real estate developers have attracted a reverse movement of people where urban–rural migration was the main factor. 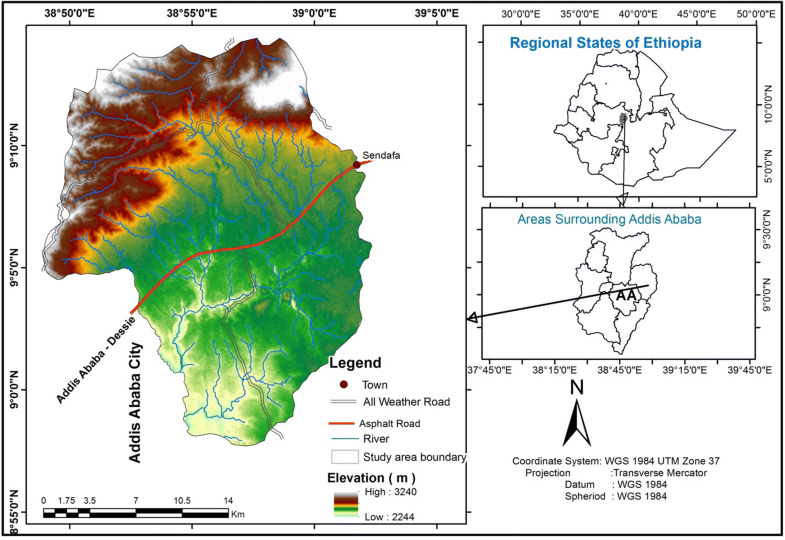 The situation was further complicated when the new master plan of Addis Ababa was about to be implemented had dislocated many thousands of people (for investment purpose in Addis), and were settled along streams/river banks (Dire-Sequru, Legatafo, Legadadi), road and along the forest margins (FZSeP 2011). The new settlers started constructing new houses by clearing forests including native trees (e.g. Podocarpus falcatus, Olea europaea), and forests served as a source of livelihoods often earning lucrative income by selling construction poles at high prices in the urban markets (FZSeP 2011). Hence, the area largely attracted large number of population mainly the poor who were unable to make a living in Addis Ababa City. Closely similar findings were reported by Dadi et al. (2016) that excessive demand of the land by investors fuelled urban sprawling and settlement at the expense of prime agricultural land in the outskirts of newly industrializing town of Dukem. They have further noted that the numbers of individual industries grew from less than 50 before the designation of Dukem town as Industry Zone in 2005, to over 642 units in 2011. Thus, urban displacement coupled with rapid rural–urban migration to the capital and back to the fringes of peri-urban areas of Addis Ababa led to expansion of settlements on fertile lands and forests were the net losers in peri-urban areas of Addis Ababa (Leulsegged et al. 2011; Lohnert 2017). Deforestation is undoubtedly one of the serious environmental problems where developing countries face enormous challenges. Some of the region wide studies inform that forest cover declined substantially in sub-saharan Africa, at an average annual rate of − 0.7% between 1975 and 2000 and interestingly a biome level conversion of forest (Afromontane forests) showed a higher rate (− 2.1% per annum) of deforestation (Brink and Eva 2009). The finding is very close to recent estimate of Ethiopia’s annual deforestation rate of 1.1% from 1995 to 2010 (FAO 2010) and our study also showed that forests had declined at a rate of − 2.53% annually since 1950s. Our study area is located in the Dry Afromontane region (Friis et al. 2010) and our finding falls perfectly into the general pattern of deforestation observed in sub-saharan Africa (Brink and Eva 2009). However within sub-saharan Africa region east African countries such as Burundi, Rwanda, Tanzania and Uganda had generally shown a 3% increase of forest from 1984 to 2011 (e.g. Berakhi et al. 2015). Though forest cover increased in the eastern Africa region, it was not due to what some calls as a “forest transition” where net afforestation exceeds net deforestation (Lambin and Meyfroidt 2011) rather land clearance for agriculture was mainly depended on woodland savanna than forests in these counties (Berakhi et al. 2015). The deforestation patterns observed in our study area aligns well with the regional biophysical dynamics especially drought cycles and socio-political and economic changes in Ethiopia and beyond. A very high rate of annual deforestation during the first study period (1957–1975) was mainly due to a combination of demographic pressure and to some extent economic development policy of the imperial government. As Rahmato (2009) indicated agricultural land holding had already declined in the last days of the imperial government (early 1970s) due to increasing population pressure and government economic development policy which were meant to increase production crops for export. As we discussed earlier forest cover increased during 1975–1995 which coincided with crises situations due to the aftermaths of two major droughts in Ethiopia 1973/74 and 1984/85. These two major drought incidences resulted on major famines and social disruptions in Ethiopia. Thus, the crises had pushed for a shift in government policy, particularly with support of donor organizations, to engage in afforestation/reforestation of degraded lands (Amsalu et al. 2007; Teferi et al. 2013). During this period as shown in our results, barren land had increased due to land abandonment either due to government resettlement and villagization programs of mid-1980s where people from highly densely settled areas were relocated to sparsely populated lowlands and rift valley areas (Amsalu et al. 2007; Rahmato 2009). These plantation forests belonged to the government and most of the local people participated through a food-for-work scheme. Unfortunately, such positive change in forest cover did not spare destruction after the fall of derg regime in 1991 due to ownership discontent. Moreover, the new government after 1991 adopted a neo-liberal economic development policy where privatization and devolution of power were the two pillars. Consequently, both federal and local governments started to encourage private investments to their regions by providing tax incentives, infrastructure (Dadi et al. 2016; FZSeP 2011) and other utility services. These market incentives and policy directions formed synergies with high rate of urbanization (4.4%) and infrastructural development fuelled high demand for agricultural products and wood for constructions. Moreover, high demand for vegetables and fruits in Addis Ababa and newly emerging satellite towns served as triggers of forest cover loss in the study area. This was evidenced by a high rate of recent deforestation 7.4% while simultaneously about 5.4% of total the forests were recent regrowth which indicated high level of disturbance and vulnerability of forests to degradation. Similarly, large tracts of forests of the study area have now been exposed to degradation due to disturbance vectors such as road networks, streams and government policy which puts an axe on the hill side forests of the study area. Over the last six decades the study area has shown an unprecedented level of LULC change. The main drivers of change were the combination of biophysical processes, demographic dynamics (population growth, density and internal migration), urbanization and successive government policies. The massive conversion of forests to agricultural lands and barren lands may have far reaching impact on biodiversity and ecosystem services, land degradation and a change in local hydrological regime. As to biodiversity and ecosystem services the remaining forests are found in steep slopes on the northwestern section of the study area. Nevertheless, increasing urbanization and infrastructural network would drive further loss due to accessibility and livelihood challenges of the recently migrated poor from the rural and urban areas. These forests on the mountain hills are ‘refugia’ of perhaps previously widely distributed dry Afromontane vegetation and may serve as a genetic pool for future dispersal but forest clearance for agriculture and other forms of disturbance such as evidenced by recent regrowth may result in declines of ecosystem integrity and the loss of ecosystem services provisions to the local communities. Moreover, land degradation particularly soil erosion and fertility decline are one of the serious challenges facing Ethiopia in the last few decades. Our study informs that market demands for food crops and forest products have generated massive pressure on land based resources. Especially agricultural expansion was so pervasive during the last two decades. This resulted in expansion of cultivation in steep slopes and conversion of forest lands to agricultural lands. Such removal of land cover and cultivation of marginal land such as slopes to cultivated fields may increase the risk of soil erosion and fertility loss. Moreover, the recent government investment policy and infrastructural development have further increased vulnerability of forests to degradation and heightened deforestation. Thus, the rate of soil erosion due to land conversions is expected to worsen in the study area unless aggressive forest management actions are undertaken. Furthermore, changes in LULC have also a great impact on local hydrological regime. The study area is endowed with large reservoirs which are sources of water supply to Addis Ababa city and its environs since the 1970s. However, forest degradation risk map analysis we conducted show that the likelihood of increased risk of surface runoff and stream flows discharging from the degraded highland areas to the reservoirs. This has also an impact on the volume and quality of the two reservoirs (Dire and Legadadi dams) by increasing the sediment inflow. Therefore, priority should be given to implement effective soil–water conservation with active participation of local people. KT has designed the study, collected data, carried out the field work, analyzed and interpreted the document of the manuscript. DW has contributed in literature work, reviewing and editorial works. Both authors read and approved the final manuscript. We thank Tafo, Dire-sequru and Legedadi local elders and monks for their genuine collaboration and valuable time to provide their views. We also thank indeed the two anonymous reviewers and the editor for their very insightful and constructive comments. Finally, we are greatly indebted to Earth Explorer of USGS and ESA for offering free access to Landsat and Sentinel-2 images. The authors declare that they have no conflicting interest. The data is included in the manuscript. We have agreed to submit to submit for Environmental Systems Research and approved the manuscript for submission.